I never quite know what to do for the blog when I'm further along in a series. 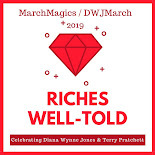 Sometimes I write a nice big recap post of the whole series but today I've decided just to mention the two series books that I've read this year in case anyone is somehow unaware that these books and series exist. I wouldn't want anyone to miss something good! 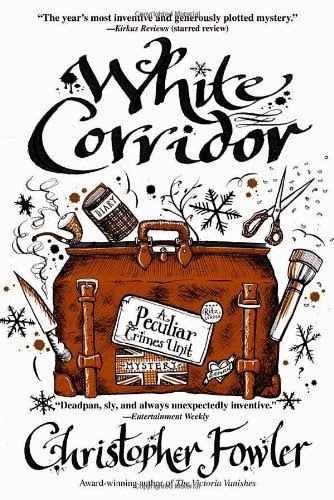 White Corridor is the fifth book in the Peculiar Crimes Unit Mysteries, also known as the Bryant and May Mysteries, by Christopher Fowler. This was a pretty dark entry in the series so, while I enjoyed it, it is not my favorite of the bunch. Plus, the detectives were in a situation that brought both my claustrophobia and my hatred of being cold into play and made me pretty uncomfortable. Luckily, there are twelve books in this series so I'm guessing when I pick up the next one, it will probably be something completely different. My comment disappeared into cyber-ether! Argh! Now I'm trying to remember what I said ... I love both these series. I'm only on about the fourth book in Alan Bradley's series, but I'm all caught up with the Peculiar Crimes Unit books, most of which I've listened to in audio. Okay, let's see if this works ...! I've heard that the Bradley series is also very good on audio so I might do rereads of the series later this year that way. I haven't even thought of trying the other series on audio but that might be fun! I had never heard of either of these series. 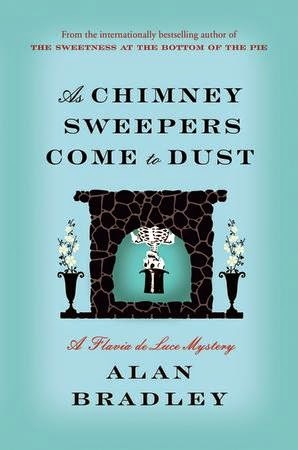 I LOVE the title As Chimmney Sweepers Come to Dust. Brilliant. I always wonder what to do about late-in-a-series reviews as well. Often I go for it, or plan a wrap up post about the whole thing (and then almost never do it whooops). I have had so many recommendations of the Bryant and May series! Maybe I'll get the first few for my upcoming travel reading. They sound like a good book for travel -- absorbing, but not too demanding. The first three were fantastic and perfect travel reading. I had one of them with me on vacation two years ago and it kept my attention. I really need to catch-up with Alan Bradley! Oh dear, there are seven Flavia books now? I think I've only read two . . . Must get on that. It's so easy to get behind on series when there are so many good ones. I have at least two here that I am collecting the books but don't have time to start yet! LOL, Trish. :) I read every book in this series within probably the first two weeks that it's out. I'm not as up-to-date with other series because I let them pile up for too long.